With Ben Jealous in Maryland and Stacey Abrams in Georgia, El-Sayed can lead a progressive revival in the states. The 2018 election has the potential to usher in a new generation of Democratic governors who are ready to undo the damage done by the Republican wrecking crew that took charge in the states after the 2010 and 2014 midterms. Candidates like Ben Jealous in Maryland and Stacey Abrams in Georgia can move their states in a progressive direction, and primaries in August and September would add a number of progressives to the list of Democratic gubernatorial candidates who could triumph this fall. One of the most impressive of these is Dr. Abdul El-Sayed, the 33-year-old former executive director of the Detroit Health Department who was inspired to run for governor of Michigan by his fury at Republican assaults on public health, workers’ rights, and democracy in that state. He has waged a campaign that has renewed hope; and if he is nominated in the state’s August 7 primary, we believe his candidacy and governorship could create a model for making necessary change nationwide. It is with this in mind that The Nation endorses El-Sayed’s gubernatorial bid. We do so because of his progressive agenda and his striking record of accomplishment. A Rhodes scholar who had gained international attention for his work on public-health issues, El-Sayed gave up a promising teaching career to rebuild an urban health department that had been hobbled as Detroit was forced into bankruptcy. Amid the devastation caused by funding cuts and a state-imposed “emergency manager system,” El-Sayed began a process of renewal that earned high marks for programs that improved the safety of drinking water in Detroit schools and day-care centers, provided schoolchildren with glasses, and challenged corporations to address asthma by reducing emissions and investing in parks. A passionate believer in the combination of immediate action and long-term planning, El-Sayed knows what must be done to fix a state government that has failed Flint and other communities when it comes to guaranteeing the most basic of human needs: access to safe and healthy water. But he does not propose merely to bandage the wounds that linger after years of neglect and misrule. El-Sayed embraces the premise that states should be America’s laboratories of democracy. He wants Michigan to lead the nation when it comes to developing a single-payer health-care system, fully funding public education, implementing criminal-justice reform, welcoming immigrants, and fighting poverty. In this year of political upheaval, El-Sayed is not the only gubernatorial candidate who is proposing state-based reforms that would show the federal government what can and must be done. But there is a strong case to be made that he has the most detailed and doable plans for making these changes. El-Sayed has surrounded himself with a staff of young scholars and activists who have poured time and energy into developing plans to take the profit motive out of public education and make college tuition-free for working-class families, to protect the health of the Great Lakes and transition to a renewable-energy economy, to guarantee Internet access for all (with net neutrality), and to renew democracy by getting money out of politics and ending gerrymandering. This is a big-ideas campaign with bold ambitions that has attracted support from Vermont Senator Bernie Sanders and New York congressional candidate Alexandria Ocasio-Cortez, Democracy for America, Our Revolution, the Progressive Change Campaign Committee, Justice Democrats, 350 Action, and the Michigan Nurses Association. Yet El-Sayed’s embrace of grassroots democracy is what truly distinguishes his bid. He has traveled to every corner of the state and reached out to every urban and rural community with a message of unity that places its faith in voters to make him America’s first Muslim governor. With so much chaos in Washington and so much division nationwide, it is inspiring to believe that states might take the lead and renew the promise of America. Like Jealous in Maryland and Abrams in Georgia, El-Sayed is providing that inspiration in Michigan—with a campaign that has attracted throngs of young supporters and that has gone into traditionally neglected neighborhoods seeking to create a spike in voter turnout. This does not mean that El-Sayed will be the Democratic nominee this fall; the primary competition in Michigan is fierce, and much of the party leadership has opted for another contender, former state Senate minority leader Gretchen Whitmer. Whitmer is an able if more cautious contender, not unlike some of the qualified contenders who ran against Jealous and Abrams in their primaries. But this year demands more than cautious approaches and cautious candidacies. This year demands a transformational change. 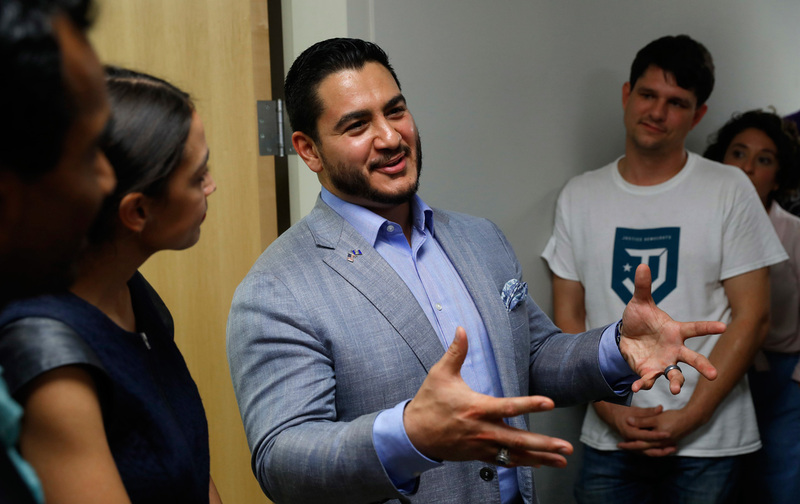 Like Ben Jealous and Stacey Abrams, Abdul El-Sayed offers the prospect of just such a politics.